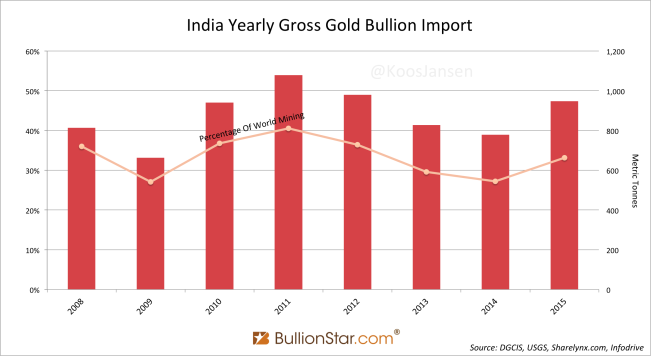 While India’s gross gold bullion import in 2015 reached the third highest amount ever at 947 tonnes and gross silver bullion import reached the highest amount ever at 8,504 tonnes, the Indian government is perpetually trying to obstruct the populace from protecting their wealth. 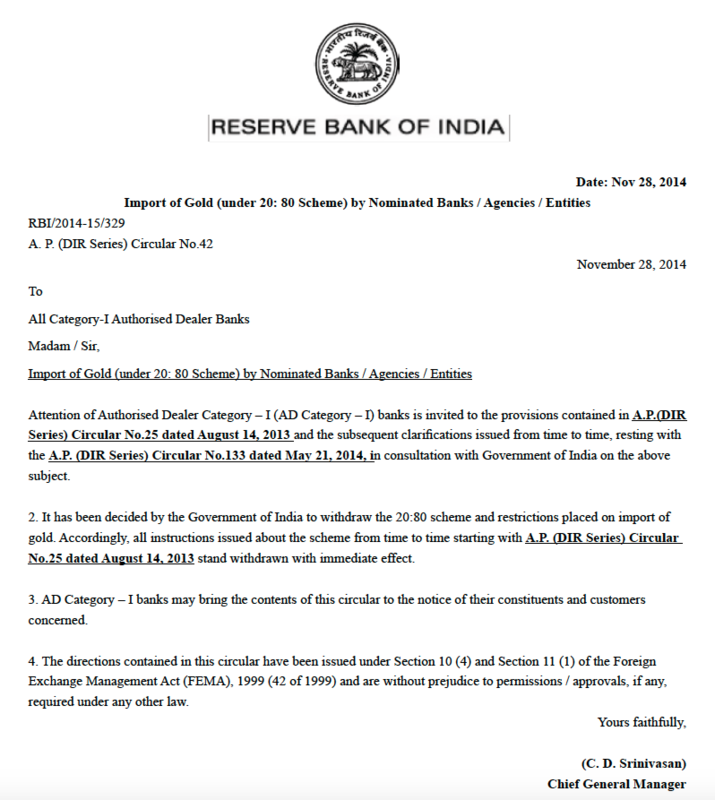 Last week I was going through gold and silver trade data released by the Indian Directorate General of Commercial Intelligence and Statistics (DGCIS) and observed strong import of precious metals in 2015. At the same time I was reading the documents, news came out that stated the Indian government was to implement extra rules to hinder its people from buying gold. In my view, the situation in India is another perfect example of a government’s nonsensical fight against the economic tide. Central banks do it all time don’t they? In an ongoing failure to understand what capitalism is about, the Indian government continues to “disagree” with its citizenry where savings should be placed. Whenever the Indian people increase gold purchases to secure their financial wellbeing, the government is keen to find new tactics to suppress this free market expression. The government aims the country’s wealth to be where it suits them – in the fiat currency they issue and control, but the populace believes fiat currency is inherently vulnerable and chooses physical gold for its long-term wealth preservation. It seems the more the Indian rulers resist private gold demand, the stronger the forces they’re fighting become. As we’ll see below, most undertakings by the government to keep its people from buying gold have been in vain. First, let’s have a look at an overview of all the measures undertaken in the past years. At the end of the post I will present the details of the latest gold and silver import data (India mostly relies on import for its precious metals hunger). When the price of gold made its famous nosedive in April 2013 Indian physical gold demand skyrocketed off the charts; in May 2013 India imported 165 tonnes of gold, the highest monthly tonnage ever. In reaction, the government decided in June 2013 to raise the import duty on gold from 4 % to 8 % and in August 2013 from 8 % to 10 %. In addition, in July 2013 the “80/20 rule” was implemented, forcing traders to export 20 % of all imported gold. The import duty on silver was raised to 10 % as well, although silver was not subjected to the 80/20 rule. The result was that by September 2013 India’s gold import through official channels had fallen to a mere 16 tonnes, but smuggling in gold had exploded. Gold trade was diverted to the black market with all due consequences – thriving criminality threatens social and economic stability – and India’s established gold industry organizations fiercely objected the government’s policy. Another consequence was that silver import has seen spectacular increases ever since (see further below). 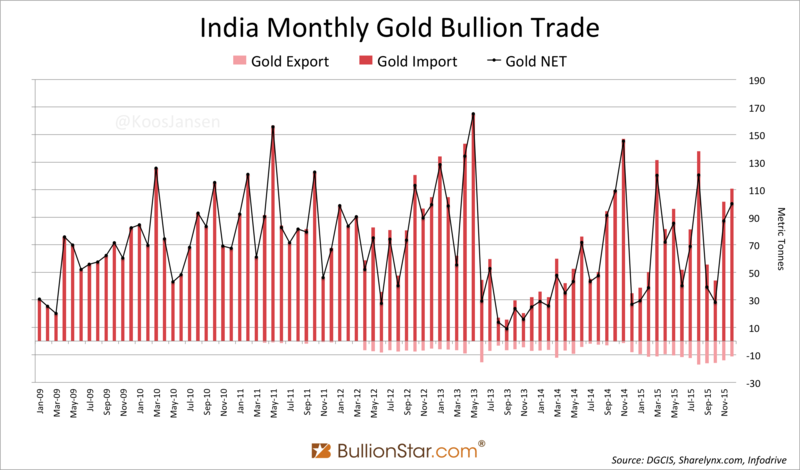 Although heavily restricted, Indian gold import through official channels bounced of the lows in mid 2014. Eventually, the 80/20 rule was withdrawn in November 2014 while the Indian government was preparing a new trick: the gold monetization scheme, which was to “to mobilize the gold held by households and institutions in the country” and ”be able to reduce reliance on import of gold over time to meet domestic demand”. In my words, the scheme was intended to oversubscribe the people’s gold by exciting them to deposit their metal at commercial banks. The catch is that the gold depositor is technically lending his gold to the bank, whereby he risks losing his metal if the counterparty goes belly up – although these risks were not disclosed in the brochure. Ironically, the essence why people buy gold in the first place is protect their wealth, not to take risks (ie by lending). Not surprisingly, the gold monetization scheme has failed miserably. In the first two weeks after its launch in November 2015 only 400 grams trickled in – bear in mind, there is an estimated 20,000 tonnes of physical gold owned by the Indian private sector. 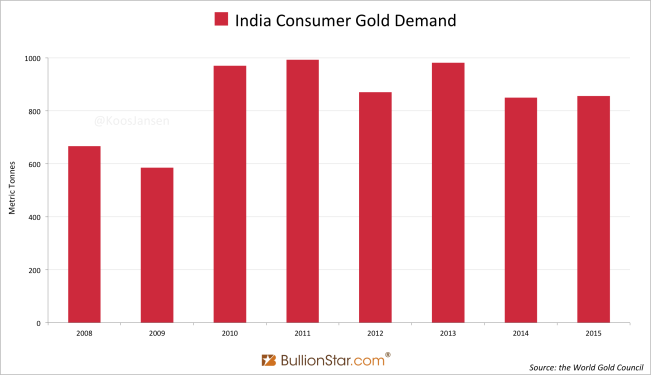 It does not look like the gold monetization scheme will ever succeed in India. Data from the World Gold Council shows Indian consumer gold demand accounted for 848.9 tonnes in 2015. Reasons enough for the Indian rulers to continue their hopeless quest to limit demand. In January 2016 the government introduced a rule that forces jewelry buyers to show a Permanent Account Number (PAN), which the vast majority of rural customers do not have, for any purchase above Rs 200,000. And it proposed the re-imposition of a 1 % excise duty. Remarkably, the excise duty was first introduced in 2012 but rolled back the same year as jewelers went on strike. This time around jewelers are seeking the same relief. Since 2 March they’re on strike indefinitely (speculating; the excise duty will not succeed). Let’s head over to the most recent (final) trade data released by India’s customs department, the DGCIS. India’s gross gold bullion import in December 2015 was robust at 111 tonnes, up 9 % from November and up 218 % from December 2014. Total gross gold import for India in 2015 came in at 947 tonnes, up 22 % from 2014, the third highest amount ever. India gross exported 11 tonnes of gold bullion in December 2015, down 22 % from November and up 35 % from December 2014. Gross gold export for the year 2015 aggregated to 150 tonnes, the highest ever, up 136 % compared to 2014. Gold bullion export might be elevated due to India’s increased refining capacity. Net gold bullion import in December 2015 came in at 100 tonnes. Total net gold import for 2015 accounted for 797 tonnes, up 11 % year on year. 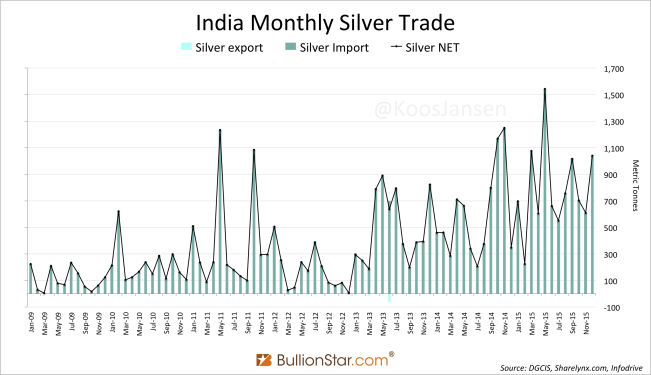 India’s gross silver bullion import was very strong in December 2015 at 1,042 tonnes, up 71 % from November and up 198 % from December 2014. Total gross silver import in 2015 accounted for a staggering 8,504 tonnes (! ), up 20 % from 2014. 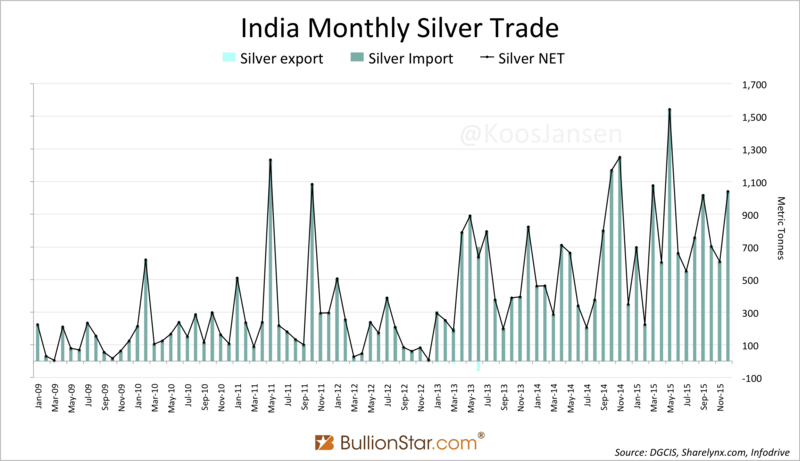 As, silver bullion export from India is neglectable, net import in December 2015 accounted for 1,041 tonnes and total net import for 2015 came in at 8,494 tonnes. The latter being 31 % of world silver mining output! 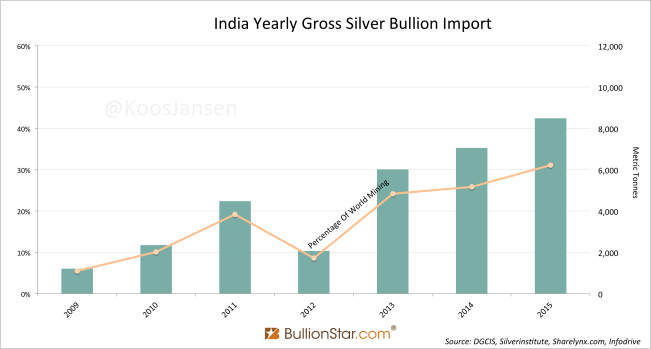 From looking at official precious metals import and demand numbers we can wonder if the many restrictions from the Indian government have accomplished anything to their likes. One thing is for sure; the Indian people did not substantially bought less gold – and did buy substantially more silver. Instead of hopelessly resisting and intervening in the Indian economy, the government could also choose to allow free market forces and/or even support the people’s love for gold to bolster India’s gold industry for it to become a global powerhouse. Wouldn’t that be much more effective? Kindly note, the cross-border trade tonnages for this post, calculated by myself and Nick Laird from Sharelynx.com, are based on the Rupee values disclosed by the DGCIS and the monthly average metal prices. The gold and silver bullion import and export figures mentioned in this post exclude smuggling and cross-border trade in precious metals jewelry.